The very first rendering of SIX25BV has been released and we have to say, we’re pretty into this one. 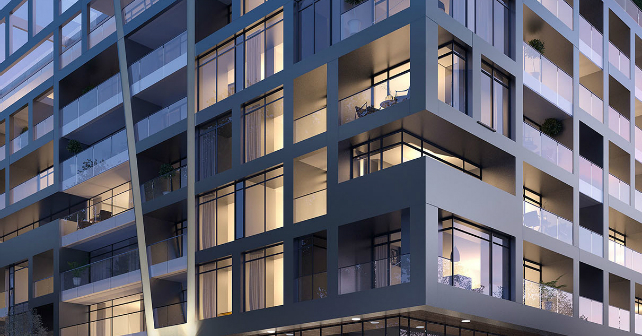 Haven Developments worked with Teeple Architects to design this new boutique condo planned for North York. 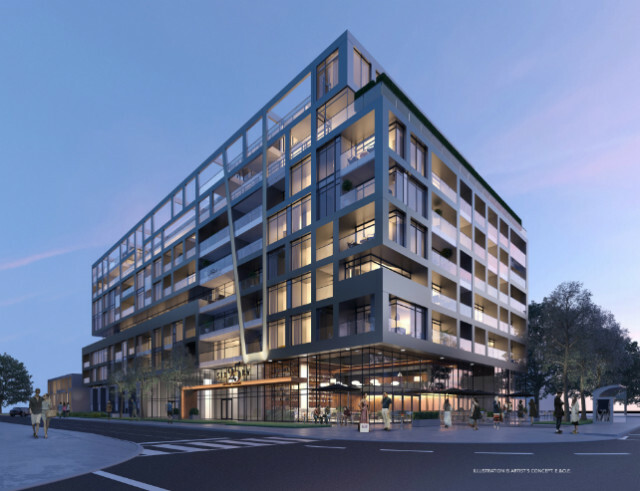 SIX25BV will rise eight storeys at - you guessed it - 625 Sheppard Avenue East in the Bayview Village neighbourhood, which is becoming a hot spot for distinct and interesting looking residential developments. The condo promises to be “different by design,” and now that we have our first look, we believe it will be! We really love the asymmetry of the design and the bold geometric lines that give the condo building a sense of depth. The different sized windows and balconies, the open air area on the rooftop, and the varying shades of materials used add a complexity to the design that manages to come across simple as a whole. SIX25BV will be comprised of condo suites, lofts, and townhomes, with a total of 146 units. Units will range approximately from 450 to 1,350 square feet, with prices starting in the mid $200,000s. You know what that means - there are many opportunities at SIX25BV for first-time homebuyers. Since the area is an up-and-coming area for condo dwellers, we’re sure there will be many investors purchasing, making for a healthy mix of end-users and tenants. II By IV Design led the charge on the interiors, and though we don’t have any renderings of the interiors yet, the firm has a pretty good reputation for pulling together high quality, contemporary spaces. Some of the interior features and finishes at SIX25BV will include 9’ to 10’ ceilings, premium laminate flooring, designer kitchen cabinetry, sleek integrated appliances, quartz countertops, and ceramic tile. Of course, the sophisticated design will flow through the rest of the condo building into the amenity spaces. There will be a stunning rooftop terrace providing views of the surrounding historic area and lush greenery of the tree-lined streets. The party room and event space will be perfect for entertaining large and small groups, and having access to a fully equipped gym will inspire you to eat healthy and lead an active lifestyle! According to Walkscore.com, SIX25BV’s area has a Walk Score of 81 out of 100, which means that it is very walkable, so most of your daily errands can be accomplished on foot. The popular Bayview Village Shopping Centre is only three minutes away on foot, and the Loblaws is a five minute walk away! One thing that makes the condo lifestyle even better is the convenience of being able to walk to get your weekly groceries. If you prefer to rely on transit than driving around in a car, you’ll be happy to know that Bayview subway station is a three minute walk away from SIX25BV and Bessarion station is only a five minute walk. Nearby transit options are especially good for first-time homebuyers who need to keep their monthly costs to a minimum and go without car ownership. 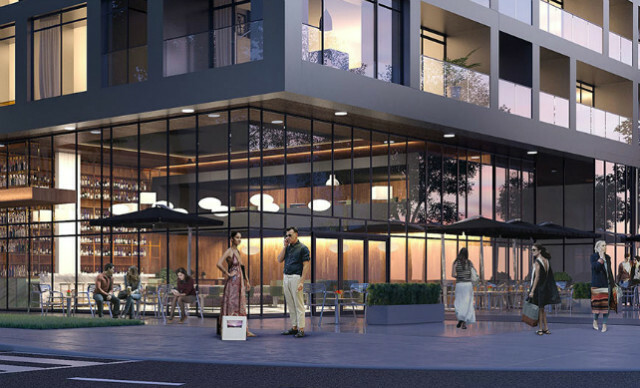 Whether you’re an intrigued investor, a young working professional, or a first-time homebuyer, you should register for SIX25BV in North York by Haven Developments. The sales centre will be located onsite at 625 Sheppard Avenue East and we’ve received word that it is nearly complete, so you will soon have your chance to visit and see the suite options in person.